Product use and features: The machine is mainly used for non-ferrous metal sheet and profiles of thin plastic materials, cold extrusion into a certain size of the mass, easy storage, transportation and smelting. This model has a package and push the package form, simple and reliable, high efficiency, low power consumption. Machine Dimensions mm: Length 4200 * Width 3200 * Height 2500. Metal balers can be a variety of metal scrap (scrap, shavings, scrap, scrap aluminum, scrap copper, waste stainless steel, scrap cars, etc.) 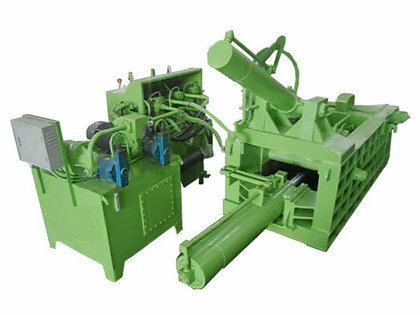 extrusion box, octagonal body, cylinder and other shapes of qualified charge, can reduce Transportation and smelting costs, but also improve the speed of casting furnace. The series of balers are mainly used in steel mills, recycling industry, as well as nonferrous metals, ferrous metal smelting industry. ① all models using hydraulic drive, you can choose manual operation or PLC automatic control. ② out of the package has a package, side push the package, the former push the package, such as artificial package. ③ variety of models to choose from: different pressure, the size of the box, mass size package.